We have a selected range of presentation PA speakers that we offer to hire. The cabinets are extremely compact and do not take away from the asthetics of the room. Their tailored frequency response makes them ideal for speech and music reproduction. Featuring soft-clip limiters for total protection against overloading. This offers you great audio impact with minimal visual impact, because your PA system should be heard but not seen! We can provide systems with multiple sets of speakers for larger conference rooms to provide an even spread of sound for your guests. We have a range of our most popular systems that are hired for presentations below. These systems offer the best in sound repoduction for your event. If you require a more complex system please contact us with your requirements. We have a range of projectors to suit any presentation environment. 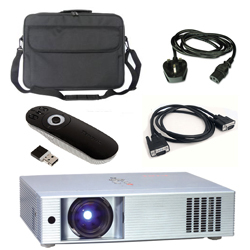 Our projector hire equipment is compatible with both apple mac and Windows Laptops and netbooks. Projector hire start at £60.00.. ranging from 2000 lumens to 15,000 lumens. We can supply a range of laptops both Mac and Windows based laptops are available to hire along with presentation clickers to allow for hassle free presenting. We can provide leads to hook your laptops upto any PA system allowing audio playback from your presentation. Please contact us with your presentation system requirements and we will provide a quotation for suitable equipment. If you require a projector screen to go with your hire, we can help! We have a range of projector screens to suit any size venue in tripod and fastfold styles. 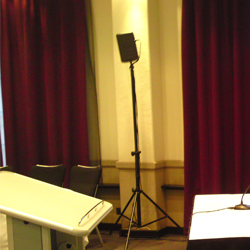 We can also supply screens with drape kits to add that finishing touch to your presentations asthetics.